She greets a visitor with a wide smile and bright eyes. That happy face sits atop 46 inches and 55 pounds of wrestling prowess. Avery Mack, 7, of Sartell, is in a small but rapidly growing group of girls in club wrestling. Most recently, she won first place for her age group in a Minnesota USA Wrestling tournament March 9 in Rochester. A few years ago, only a dozen girls competed. This year, 150 participated in the tournament. 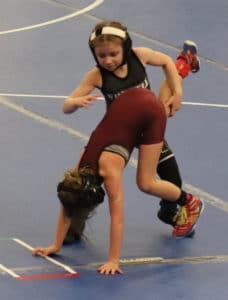 Avery practices three times a week at a Waite Park gym, Wrestle-Jitsu, with a class of 20 that includes one other girl. The young athletes work on technique and drills to build coordination, wrestling skills and how to fall correctly. The teacher is Jake Clark, who has a long list of achievements including wrestling in the Marine Corps. 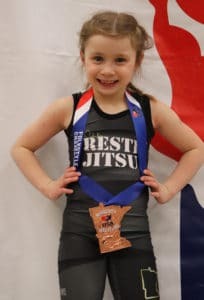 The St. Francis Xavier first-grader has been wrestling about two years and she’s collected medals to recognize her accomplishments. She likes winning and being at the top of the podium, she says. Wrestling is a family sport. Avery’s 5-year-old brother, Benjamin, is in the class too and sometimes the brother and sister wrestle on the mat at home. Younger brother Malachi, 3, hasn’t taken up the sport yet. Their parents are Tony and LeAnn. The couple met at Staples-Motley High School. Tony wrestled in high school and made it to the state tournament a couple of times. LeAnn ran track. Tony would like to see more girls try the sport. “Girls wrestling is the fastest collegiate sport and it’s growing. It has become the easiest way to obtain a scholarship for a female student-athlete and with that comes opportunities to get a scholarship and an education,” Tony said. The family travels to tournaments a couple of times a month and Avery enjoys traveling to far away places. In January, she placed third at a tournament in Omaha, Nebraska, and in October, she won third place in Des Moines, Iowa. While her dad explained the value of athletics, Avery warmed up with the other kids with what appeared to be a game of dodge ball. As practice started, the young athletes gathered around Clark as he asked them about what they are proud of before starting the night’s activities. To join the wrestling club, contact Clark at 612-868-7157. Avery Mack (black uniform) won first-place in a tournament in Rochester on March 9. Avery Mack shows off her medal from the Minnesota USA Wrestling tournament.